Ms. Souad Mohammad was born in Lattakia, Syria and holds two degrees from Tishreen University, a Bachelor of Arts in Arabic Literature and a Diploma of Educational Qualifications. This year marks her 13th year of teaching Quran and Arabic. 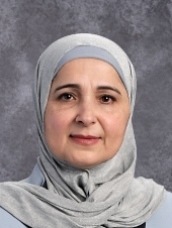 Before joining Al Fatih Academy in 2009, Ms. Souad taught at the Saudi Academy for six years. She loves teaching and enjoys sharing her love of Quran and Arabic with children..
Ms. Souad’s favorite activities are spending time with her family and traveling.